Latest stable Android 8.0 Oreo 9.5.4 for Xiaomi Mi A1 is now available for download. Recently Xiaomi has started the Stable Oreo update for Xiaomi Mi A1 but Xiaomi continuously updated the Oreo with new bug fixes and features. The Oreo OPR1.170623.026.9.5.4 for Mi A1 bring February 2018 Android Security Patch. Download Xiaomi Mi A1 9.5.4 Oreo Firmware from below to install it manually. The Xiaomi Mi A1 9.5.4 build OPR1.170623.026.9.5.4 is rolling out via OTA and will be available for all soon. 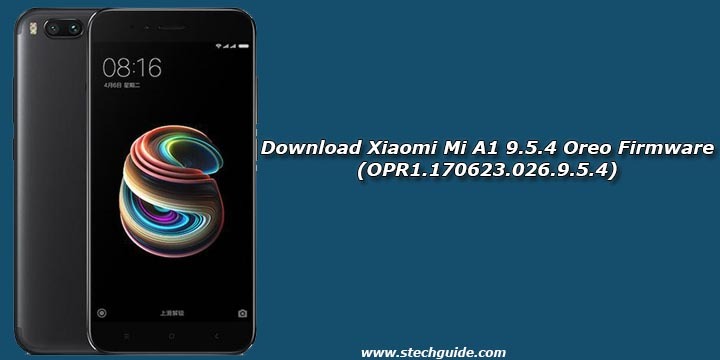 If you want to install OPR1.170623.026.9.5.4 on Xiaomi Mi A1, then you are in right place here we provide you the link to Download Mi A1 9.5.4 Oreo Flashable zip and we will also provide Xiaomi Mi A1 OPR1.170623.026.9.5.4 Fastboot ROM soon. You can Download Xiaomi Mi A1 OPR1.170623.026.9.5.4 Oreo Firmware from below. To install the v9.5.4 Oreo OTA update on Mi A1 your device, you need OPR1.170623.026.9.5.4 firmware file, extract it on PC and flash it running the flasher file. You can also check the update by going to Settings > About Phone > Software updates. You can Download Xiaomi Mi A1 9.5.4 Oreo Firmware from below to install it via the fastboot method. This method is only for the Xiaomi Mi A1. Download Oreo 9.5.4 Flashable ROM from above and save it on your device. Now do a Factory Reset (Optional) by Goto Wipe>Advanced Wipe>Select Wipe cache, Dalvik cache, System, and data and swipe to confirm it.